Today, the Human Rights Campaign (HRC) — America’s largest lesbian, gay, bisexual, transgender and queer (LGBTQ) civil rights organization — responded to a new report released by the Organization for Security and Cooperation in Europe (OSCE) documenting horrific anti-LGBTQ crimes against humanity in the Russian republic of Chechnya that first made headlines in April 2017. Refuting denials from Chechen and Russian authorities, the report details the systematic torture, abuse and murder of LGBTQ people. There are also a number of recommendations for other OSCE nations, including the United States. In particular, it calls on those countries to welcome LGBTI refugees from the Chechen republic and take into account the “special security needs” of these refugees by providing them with safe housing as well as medical and psychological support. 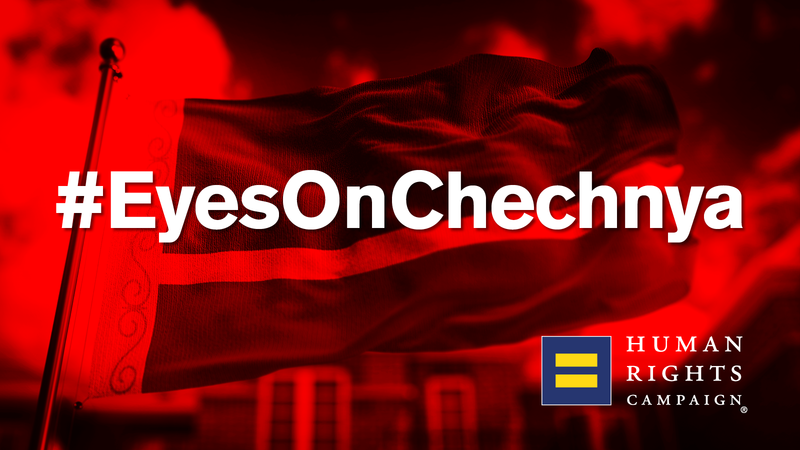 Since news of the atrocities first broke more than 18 months ago, HRC has worked to shine a spotlight on the dire situation unfolding in Chechnya through the organization’s #EyesOnChechnya campaign. In that time, the Trump-Pence White House has refused to publicly condemn the anti-LGBTQ attacks, even as Vladimir Putin licensed the violence to continue. While the U.S. Treasury Department did place sanctions on certain Chechen officials in response to their human rights violations, and U.S. diplomats supported the OSCE fact-finding mission, President Trump, Vice President Pence, and Secretary Pompeo have never once spoken out publicly against what has taken place there. In July, on the eve of the Trump-Putin summit in Helsinki, HRC projected an enormous message on the Presidential Palace demanding that Trump and Putin immediately condemn and investigate the ongoing anti-LGBTQ crimes against humanity occurring in Chechnya. On April 1, 2017, Novaya Gazeta, a Russian independent media outlet, first broke the news that Chechen authorities had rounded up and detained in secret prisons more than 100 men who were suspected of being gay or bisexual. Chechen leaders have denied these accusations, going so far as to deny the very existence of LGBTQ people in Chechnya — a claim the Russian government astonishingly repeated. Chechen officials have also reportedly encouraged families to murder relatives they suspect might be gay or bisexual. While the initial detentions and attacks targeted men suspected of being gay or bisexual, the campaign has also brought about a surge in lesbian women sharing stories about humiliation, abuse, and threats they have faced from male relatives or from others. Transgender Chechens have also fled violence. While former Secretary of State Rex Tillerson did reportedly write a private letter to Russian Foreign Minister Sergei Lavrov raising the human rights abuses, that letter was never released publicly nor was it accompanied by any public statement on Chechnya. In October 2017, HRC filed a Freedom of Information Act (FOIA) request with the U.S. Department of State for all records regarding that letter — a request that has yet to be fulfilled. While the White House has remained silent, both the U.S. House of Representatives and the U.S. Senate have passed bipartisan resolutions condemning the atrocities. In March, HRC also released a letter from HRC President Chad Griffin to Trump calling on him to end his deafening silence and publicly condemn the attacks as crimes against humanity. In June, a gay Chechen refugee joined HRC in Washington for a series of meetings with U.S. government officials, where he shared how he had been brutally tortured in Chechnya and managed to flee to safety in Canada with the help of the organization Rainbow Railroad. HRC also shared the first-hand story of one of the Chechen survivors on World Refugee Day.